Transitioning your side-gig or part-time venture into a full-time business can be very risky, but equally rewarding. Even if you have been building your part-time chops for some time, there are a host of new challenges when diving in full time. There are plenty of proven techniques to help make the transition as smooth as possible, ranging from time management skills to renting a co-working space and using professional accounting services. Continue reading to see the 7 most important services to consider when making the transition to full time. Getting the word out about your new full-time business is as important as anything. That handmade logo might have gotten you this far, but if you want to go full time it’s important to have a strong brand. The best Logo Design services like Deluxe and Fiverr pair you with talented designers that can bring your ideas alive—all for an affordable price. Of course if you have some design experience you can also take advantage of a range of free, Do-it-Yourself (DIY) logo makers. Once your have a strong logo you can add it to your website, social media apps, and email marketing campaigns. It’s simple to start a business page with Facebook or Twitter, and services like Constant Contact and other email marketing providers make it easy to create unique newsletters, as well as launch and grow your subscriber list. Unless you have investors lined up or some family money to get started, you need financial support to launch a full-time business. This is where Kickstarter, Indiegogo and other leading crowdfunding platforms come into play. In a nutshell, crowdfunding is the result of a whole bunch of people putting in cash to support your business idea or product. The amounts can range from just $1 to $100,000 and more, depending on the industry and platform. Millions of users have already launched with the help of a crowdfunding platform, and it can be a terrific alternative to approaching an intimidating team of venture capitalists. No matter what industry you work in today, you need an attractive website to help bring in potential customers. On average it will cost about $2,000 to hire a designer to build a website, but the leading website builders like Wix​ and Weebly​​ can help cut the costs while still providing you with a professional, user-friendly website—even if you have never built a website in the past. And once you’ve built your site, it’s simple to add extras like customer service Chatbots or an online store. Many website builders also include hosting services, which is basically the plot of land your site sits on. The type of hosting service you need (such as Shared, VPS, Cloud, etc.) depends on your business, but the leading hosting sites like GoDaddy​​ guarantee good uptime, fast load times and include free marketing offers to help you increase paid and organic website traffic. Launching a full-time business generally means your company is growing in size. If that’s the case, you will need to make sure you can hire, pay and track your employees. There are several comprehensive payroll services that can handle every aspect of the process—from onboarding to retirement. These services help you avoid common headaches associated with Human Resources (HR) and IRS fees or other compliance issues. 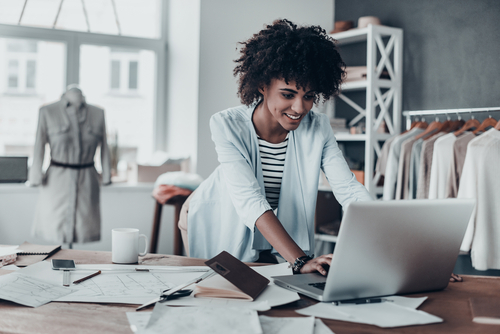 There are even a variety of business check providers that allow you to safely and securely order checks for your business online, without a bank. If you are planning on selling a product in person, you will need to get some sort of merchant services provider, also referred to as a credit card processor (CCP). These allow businesses to accept credit cards and contactless payments such as Apple pay. A Point of Sale (POS) system is the cash register of the modern era, and takes the place of conventional registers by connecting all credit card apps, accounting apps, inventory apps and more in a single unit. It allows you to process a variety of payments, track inventory and calculate sales tax. The systems are made up of 2 main parts—the hardware, such as a printer and cash drawer, as well as the software. Generally there are 4 types of POS systems you can implement into your business: mobile, table, terminal and self-service/unattended. When choosing a provider, it’s crucial to understand the fees and rates, which generally include a flat fee per transaction. No matter your business, it’s vital to ensure your data and information is fully protected. There are several services available to protect your business’s most sensitive data, including antivirus software and virtual private networks (VPNs). An antivirus software works by monitoring the internet, 24/7, and can cleanup your devices from online threats like viruses and malicious software (malware). Leading providers like McAfee and Norton generally work on all types of operating systems, include money-back guarantees, as well as 100% virus removal. While a VPN doesn’t actively scan your system for viruses, it can encrypt and protect your data connection online. It can also secure public WiFi systems and allows you to hide your IP address, allowing you to access more, local content. Before you go out and rent a massive office building, it might be best to consider starting out with a co-working space. It’s not surprising that co-working spaces are popping up in every major city, as they give several advantages when compared to traditional office spaces. In fact, some of the biggest companies in the world (including Uber and Instagram) were both launched in a co-working space. The best co-working spaces in the world, like WeWork and Regus, provide entrepreneurs an office without the extra hassle, and it helps to connect like-minded individuals working for similar goals. Overall co-working spaces cost less and provide more value by offering sound-proof booths for phone calls, high-speed internet, office cleaning services and front-desk support. Every business is unique, and there is no one-size-fits-all approach for transitioning from a part-time gig into a full-time business. With that said, there are several services such as accounting and website design that can be relevant for any type of business. Be prepared to take full advantage of these services and others to successfully grow your new venture.